The Criminal Court’s decision to bar opposition-aligned Raajje TV from observing trials is “unacceptable,” the Maldives Media Council (MMC) has said. The court had accused the station of “spreading lies about judges, meddling in judges personal affairs and engaging in actions that may harm judges” after a Raajje TV journalist and cameraman videotaped an alleged meeting between Judge Abdul Bari Yousuf and Prosecutor General Muhthaz Muhsin at Café Layaali in Malé on Sunday night. At a press conference today, MMC President Mohamed Asif ‘Mondhu’ said the court could have barred the journalist involved in the incident instead of barring all journalists from the station. Mondhu also noted that the cameraman was forced to delete the footage. 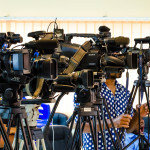 A Raajje TV staff told Minivan News that a group of young men led by Progressive Party of the Maldives MP Ahmed Assad forced the cameramen to delete it. While taking video footage inside a public restaurant was not illegal, Mondhu said Café Layaali’s owner would have been within his rights to either obstruct filming or ask them to leave if patrons complained. “However, if the footage is not connected to the owner, [they] can’t order it to be deleted,” he said. Mondhu also criticised police for not stopping the group from forcing the Raajje TV cameramen to delete the footage, characterising the incident as police’s failure to provide security to media personnel. MMC member Ahmed Hamdhoon meanwhile said the council would investigate the case to identify the culprits. Judge Bari is currently presiding over the trials of both former President Mohamed Nasheed and former Defence Minister Mohamed Nazim. The alleged meeting took place hours after the seventh hearing of Nasheed’s terrorism trial. PG Muhsin told Minivan News that the judge was already at the café when he went there for a meal with family members. “The crew were right next to me. But I don’t even think they recognised me. Because they didn’t videotape me, they were taping Bari who was sitting at another table. I don’t know why they would accuse me of such a thing. Anyone there would clearly see that I was sitting with a separate group of people and Judge Bari was sitting at another table,” he said. However, Raajje TV insists the pair were sitting at the same table smoking shisha and that Muhsin walked away when the journalist started asking questions. MP Assad and the group arrived shortly thereafter and forced the cameramen to delete the footage, after which Specialist Operations (SO) officers escorted the Raajje TV staff to the police station. The police conducted body searches and took statements from the crew. They were released afterwards. A police spokesperson said Raajje TV crew members had not been arrested, but detained briefly for videotaping in Café Layaali without the owner’s permission. Its a police state (again) geddit? Ah, this explains the recent gang chatter about 'teaching the media council to mind their own business'.